To boldly go where your taste buds haven’t gone before, part I.
Dirndl only. Dirndl Schnaps is made from The Cornelian Cherry, called "Dirndl" around the Alps, yes like the traditional Austrian women’s dress. Cornelian cherry was an important medicinal plant in the old times. The astringency of the fruits is well known since antiquity. Attention! This is different. It might blow your hat off. 1) The Dirndl fruit has little fruit sugar (below 10% of the fruit). Therefore, for a liter of Dirndl Schnaps over 25 kilograms of fresh Dirndl fruit is required. 2) A dirndl [ËdÉªÊndlÌ©] is also a type of traditional dress worn in Germany (especially Bavaria), Austria, and South Tyrol, based on the historical costume of Alpine peasants. 3) Not so long ago Dirndl Schnaps was also used as payment function. Dr. Josef Fink bought his first diesel engine for 1,000 shillings and 10 liters of Dirndl Schnaps. 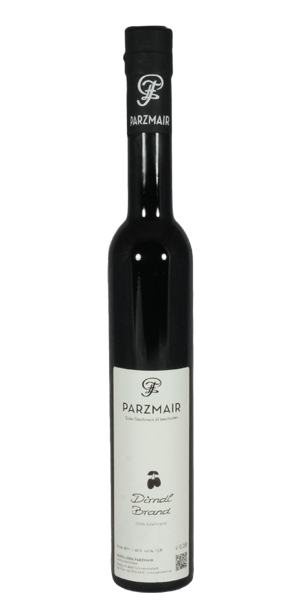 What does Parzmair Dirndl taste like? The Flavor Spiral™ shows the most common flavors that you'll taste in Parzmair Dirndl and gives you a chance to have a taste of it before actually tasting it. Transparent and oily. The aroma and the taste, hm, absolutely unusual. Like a mixture of green olives, dried cranberry, sour cherry and red fruits syrup on steroids. Floral and smoky, wild plum, Vitamin C. Lighter than expected. Slightly sour and hoppy finish.